Private and secure ground floor 2 bedroom apartment on the outskirts of town. Ideally located on a quiet private and safe residential driveway on the outskirts of town with a secure shared swimming pool (Open June to September). A clean, light and modern apartment, fully refurbished 2017. Fully equipped with 2 double bedrooms with storage, separate kitchen, a large bathroom and a living room leading onto a south facing balcony. 5 minutes walk to the harbor, beaches and 10 minutes into town. There are also several Restaurants and bars within 5 minutes walk. There are 2 adult cycles available for renters to use. A spacious bathroom with a toilet, sink unit, a bath and a shower over the bath. All Bedding supplied. Please supply own Bathroom Towels. Shared Private Parking along driveway. A selection of board games are available. A selection of beach games and equipment are available. Local Golf courses. One set of men's golf clubs are kept in the apartment. These are available for use if requested (r/h). Secured Swimming Pool open between June and September. Peaceful location and very well-equipped flat! Situated in a quiet residential area, we found this flat flat to be very quiet at night, whilst also being within fairly easy (level) walking distance of the railway station and convenient for the shops, cafes and restaurants of the Aiguillon area of Arcachon (including the wonderful poissonerie!). It is in a small, private 'complex' of 3 apartment blocks, just off the cycle path. The accommodation was extremely clean upon arrival, and the decor and furnishings new and very tasteful! The bed was comfy and, unlike other flats I've stayed in, I had no problem sleeping at night! The flat is very shady, which helps keep it cool. The terrace is also shady, except for lunch time, when there is no shade (an awning or sun parasol would have been nice!) Other than this, the owners have provided just about everything you might need for your holiday, including beach items (buckets and spades, bats and balls, beach mats etc. ), a cold bag for picnics or your purchases from the poissonerie, plastic plates, containers and cutlery for picnics, rucksacks for carrying shopping, and lots of useful information! The kitchen was also very well-equipped. In addition, there are two bikes you can use for no extra charge! These are not quite the same standard as hired bikes, but perfectly adequate for cycling around Arcachon. (If you are planning to go further afield, you might want to consider hiring bikes). I was very happy with the ladies' bike, which had a nice, padded seat and came with a basket, (although anyone shorter than me - I'm 5'5" - might find it too high). The shared pool has sun for most of the day, and is protected from any winds, by high hedges. Like most pools in this area, it is not heated. There are no sunbeds, so if you want to sunbathe after your swim, I suggest you take lilos! Although it is shared by 3 apartment blocks, we had it to ourselves each time we went! It is the same depth all over - fine for adults, but not so good for young children. The owners, although they live in the UK, could not have been more helpful! We would definitely recommend this apartment! A nice and very clean apartment in close proximity to the beaches and centre of town. (as described ).Good contact (directions/keys etc) with owners. There is a very nice pool available on site, but no child pool which is not a problem if they are supervised. The apartment is in a nice quiet area and has good parking available. We had a great time. 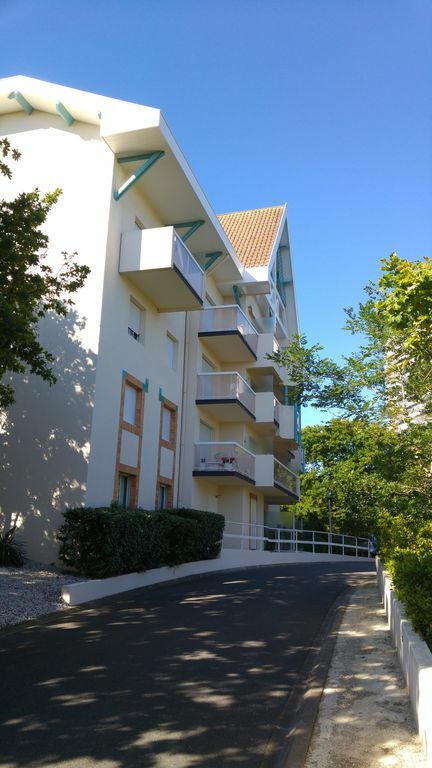 Très bel appartement situé dans un beau quartier d'Arcachon ! Très bel et agréable appartement ! Fonctionnel et confortable, décoré avec goût et surtout très propre, cet appartement nous a plu à tout point de vue ! Nous sommes une famille de 4 personnes et avons apprécié le balcon où nous avons pu déjeuner et dîner à l'ombre des arbres et au calme ! Effectivement le calme est un atout supplémentaire car la résidence est située dans un très beau quartier calme et pourtant proche du centre. Nous avons aussi apprécié les deux vélos et la piscine. Le contact aves les propriétaires a été excellent ! Nous ne communiquions que par mails, mais ils ont été réactifs et très sympathiques dans nos différents échanges. Nous recommandons vivement cet appartement ! L'appartement est très propre et refait à neuf. Les propriétaires sont aux petits soins avec vous. Appartement top. Très propre bien aménagé. Très bonne literie. Le contact par mail avec les propriétaires a été très plaisant. Appartement bien situé dans une résidence très calme. Nous avons trouvé l'appartement très propre, soigné et agréable. Un micro-onde dans la cuisine serait un plus, de même qu'un pare-douche un peu plus grand dans la salle de bains pour éviter les éclaboussures. Très bon contact avec les propriétaires qui ont été très efficaces pour gérer même à distance un problème avec le volet roulant. Région très agréable à cette période de l'année où nous avons bénéficié d'une météo fantastique pour visiter la Dune du Pilat, le Cap Ferret, Lacanau, Biscarosse et bien sûr Arcachon. En résumé nous avons passé un très bon séjour et recommandons cet appartement qui dispose de la Wifi. •	Either a short walk or regular free Bus service to apartment. Arcachon is an historic town with beautiful architecture, miles of golden beaches and one of the largest leisure ports in France. Local ports provide Arcachon’s restaurants with a vast choice of fish, seafood and the local delicacy; oysters. Locally there are areas of beauty to suit all tastes including; the City of Bordeaux and the world famous Vineyards, the Oyster ports and the local Dune du Pyla and it’s local Atlantic beaches. Walk, Cycle or drive there is something for everyone. Downpayment / Deposit requested. Security deposit requested. Discount depending on length of stay. Owner not present on location.